Children’s term-time lessons are at the absolute centre of what we are about. Children’s lessons are for those aged three years and above. Swimmers are placed into the appropriate class by their swimming ability and not by age or consideration of other factors- so as to maximise the potential for learning. New client swimmers are assessed in the water in all cases (besides those who are absolute beginners) prior to being booked into the correct class. Assessments are free and are carried out on any day of the week by one of our qualified teachers, lasting a matter of minutes. We do require assessments to be scheduled in advance so please do not hesitate to telephone to arrange one in minutes. Assessment time are as follows and should be booked in advance. Swimmers should arrive by the times shown below. Assessments will only be carried out if pre-arranged. For more information, please click here to read the sections entitled ‘Philosophy’ and ‘Programme’ on our Swimming Home Page. 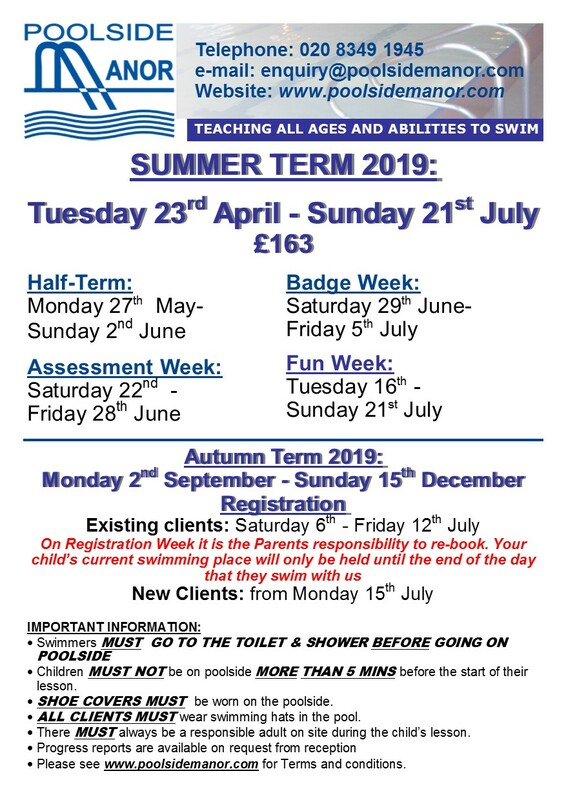 Our swimming term begins with lessons focusing on settling the child into the class and establishing the basics of their technique and their confidence in the water. Lessons build on this to improve technique further, focusing on all strokes and skills such as diving, rescue and survival. Our small class sizes allow us to continually monitor the progress of each child. The last four weeks of every term follow the cycle below. This is a chance to see how every child has progressed. During their normal lesson, every swimmer is observed by their teacher plus a senior manager. This establishes the present ability level of the swimmer to determine if the child is ready to move to the next class level or if further time is needed to consolidate their swimming ability and confidence. Any class level change is made for the following term (see ‘Registration week’) when booking on. This occurs in the fourth last week of each term. Swimmers have the opportunity to gain a badge and certificate by demonstrating they are able to meet set criteria; awarded for swimming a set distance or for the skills or technique on show. Our badge system is unique to Poolside Manor and has been developed over more than twenty years to offer a challenging, stimulating and rewarding programme, tailored to every swimmer’s ability. In this penultimate lesson, existing clients have priority to register for the following term. Availability is then opened up to new clients. Please see the section entitled ‘Our teaching programme and pricing’. Swimmers close out the term by celebrating their achievements with a fun swim session including free play and water games. For dates of weeks above, please see our dates to remember or term dates sections. Lessons are half an hour long. They start and finish either on the hour or half past the hour, between the times shown on the table below. We recommend children arrive in enough time to allow them to get changed, shower and be on the poolside for the start of the lesson with a hat (compulsory) and goggles if preferred. One 30 min session per week for 12 weeks​. £163.00 pro rata for late joiners.